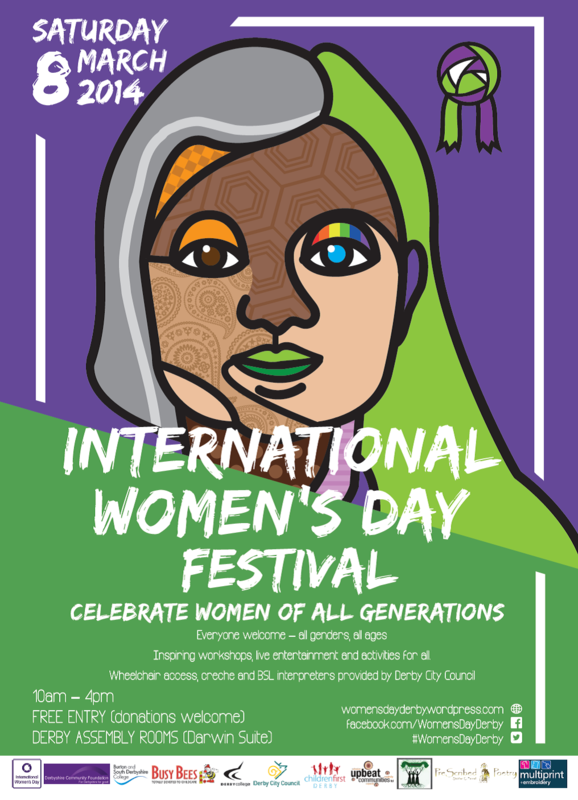 IWD 2019: Derby volunteers have been working hard all year on preparations for the uplifting annual IWD Festival for all the community to enjoy. 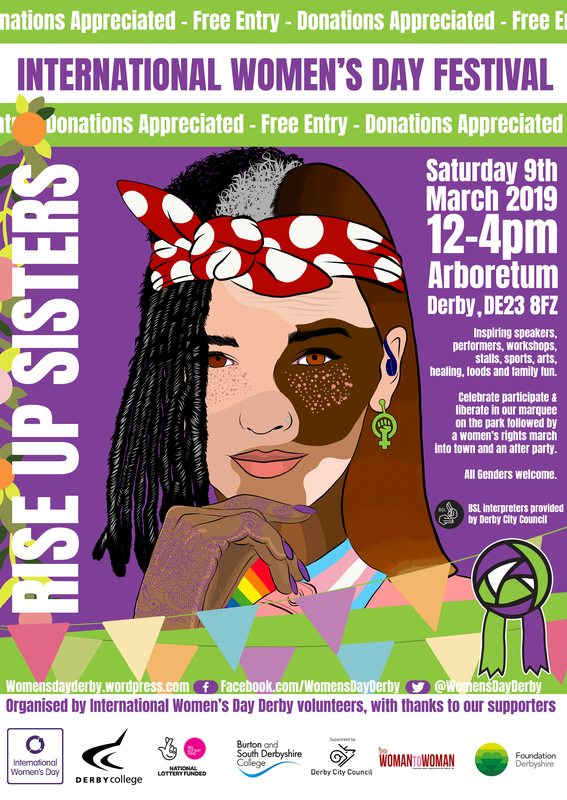 Come along to Derby Arboretum 12pm-4pm Saturday 9th March 2019 to join the celebrations in our big marquee! FREE entry with performances, stalls, sports, crafts, Human Library, inspiring talks & workshops, food vans, family fun + free creche. Afterwards at 4pm follow the Estrandosas drummers from the stage to gather and join us on a IWD Derby 2019 March route chants and songs into town and then onwards to the after-party from 5pm at Derby West Indian Community Association, Trinity Street, with food stalls, entertainment and ‘night market’ then from 6.30pm She Speaks UK hosting a female-led performance night with powerful spoken word, open mic and a ‘reclaim the dancefloor’ disco with female DJ Catie Maxx to end the night, closing at 11pm. Saturday 10th March 2018: Derby celebrates! 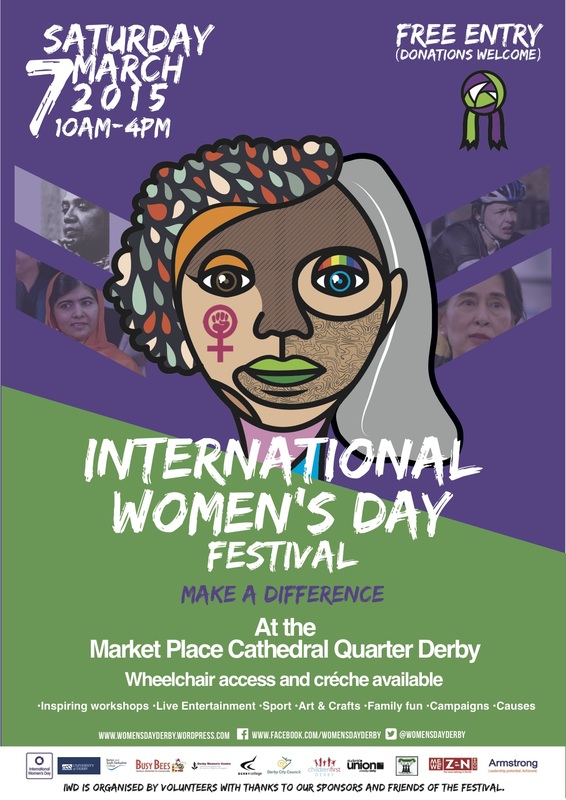 International Women’s Day Festival returns on Saturday 10th March 2018, 10am-4pm – Derby Market Place Marquee, followed by a Suffragette Memorial March. 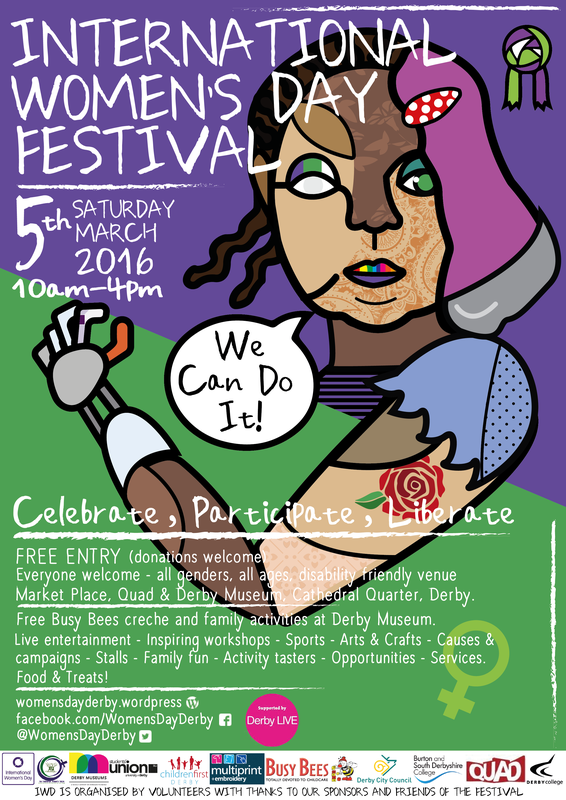 International Women’s Day Festival – Saturday 11th March 2017, 10am-4pm at the Market Place Marquee, Derby. Our 2017 theme is – ‘Celebrate our HERstory – women making waves’. Everyone welcome – all genders, all ages, all communities together. Busy Bees Heatherton is kindly providing a free crèche (donations welcome) hosted at Derby Museum, The Strand on the day. Call Kelly on 01332 518888 to book crèche places in advance. The Museum is also offering creative family fun on the day. The 2013 theme is Create & Innovate! Hosted by Derby City Council at The Council House, Corporation Street, Derby. 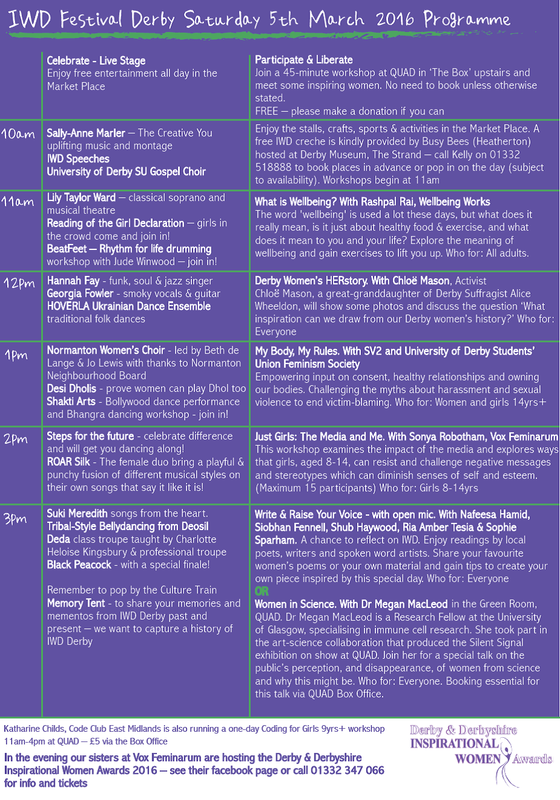 Highlights include The Red Tent, inspiring speakers on feminism, women in male-dominated careers, women making a difference in the third sector, science busking, arts & crafts, workshops, stalls, performances and healthchecks. Fun for all the family. Saturday 10th March 2012: at the Assembly Rooms, Market Place, Derby, DE1 3AH. Come along for this FREE EVENT inspired by the Olympics. Free workshops to boost your wellbeing & your career!